Two of the past wearable projects, ‘HearWear‘ & ‘Stir It On!‘ are featured in the newly released book ‘Metamorphosis’ by Stoffel Kuenen and Elisabetta Cianfanelli, from the University of Florence, Department of Industrial Design and Fashion Design. At fashioningtech.com, there is an article about this book’s release. From the article, this book deals with a very interesting subject in fashion & technology. I will soon get a copy of this book and I’m excited to finding out what’s inside! 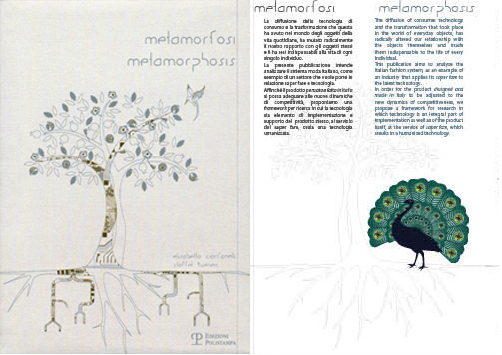 Metamorphosis is in both Itlalian and English.